Wearing skirts use to be a hard thing for me, it’s so much more difficult than throwing on a dress. 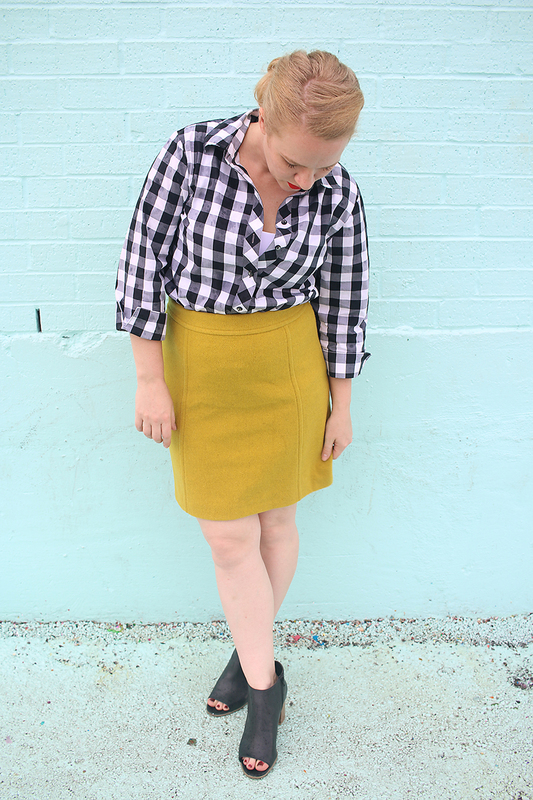 Matching the flow of the skirt with a shirt that doesn’t throw the whole thing off & then the shoes. Oh the shoes always drove me crazy. Until one day I just stopped over thinking it & got dressed. It’s so funny how we will over think things & then in turn over complicate things. I feel like this can be a pattern sometimes & honestly I just need to chill out. Because things can’t be perfect, there is no such thing as an authentic & true humanly perfect. What I see as perfect, the next person will see as a flawed attempt. And so today, I will try not to get things perfect. I’ll just give it my best. I’ll show myself some grace, like I would anyone else. So back to clothes & off my little morning revelations. Although I might need to give the topic of giving yourself a bit of slack a whole blog post of its own sometime. What a great look! I love the color of your skirt and it really pops against the black and white. So pretty. Cute yellow skirt! 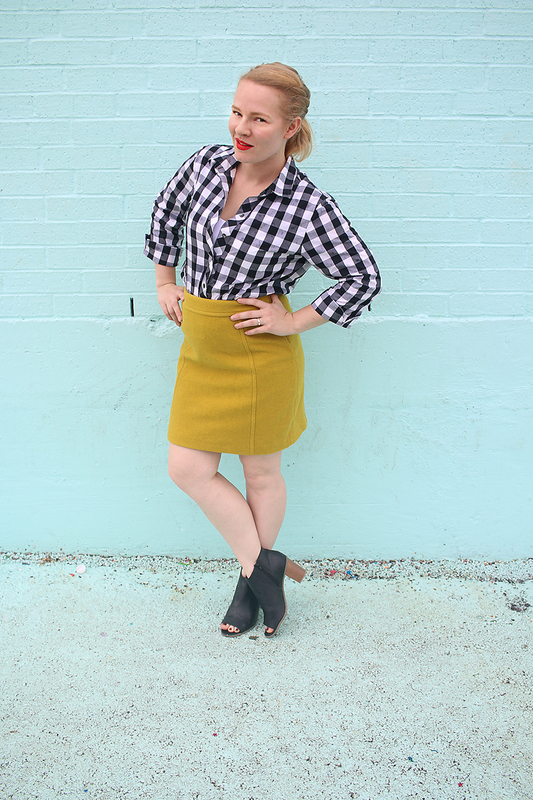 I love the bright yellow that I’ve been seeing for Fall! Cute! I love the yellow skirt! You look so pretty, and I love the red lipstick! Such a cute look, love the pop of color! Hi Pam. I stumbled upon your blog via Threads for Thomas link up and I was drawn to the color of your skirt. 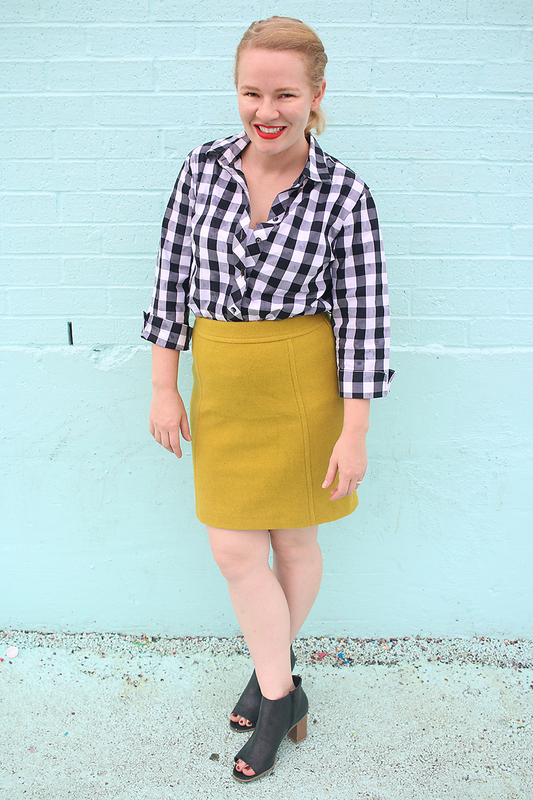 I love how you paired it up with the gingham top, never though to style my yellow mustard pants with that. Great idea and one I will be borrowing in the near future. Love this outfit so much! That color skirt is so fun! That’s a super cute outfit! I love the open toed booties! I would never put those two pieces of clothing together but they really go well together and give a fun, comfortable look! That’s the perfect fall outfit! I definitely tend to overthink things! I love this look! This is a fun look. I like the color of that skirt. I wish I could wear heels…I’m 5’10” and my husband is 5’10.5″ lol. It makes him feel short! Love the color of the skirt. What a perfect fall skirt. Great outfit! I’ve been looking for some winter skirt ideas and I love this one! Love the skirt. Very vibrant. It matches your skin tone. To top it off, the red shade of lipstick makes it a perfect look. Great look! Cute skirt, love the color! Perfect for fall! Skirts are so much easier for me! Great look. This is a great outfit! It is perfect for the fall and I love the plaid shirt! This outfit is so cute! I really love that shade of yellow! You are so cute!!! Love the bright colored skirt! Your outfit is so playful I love the pop of yellow! I love the color of this skirt! 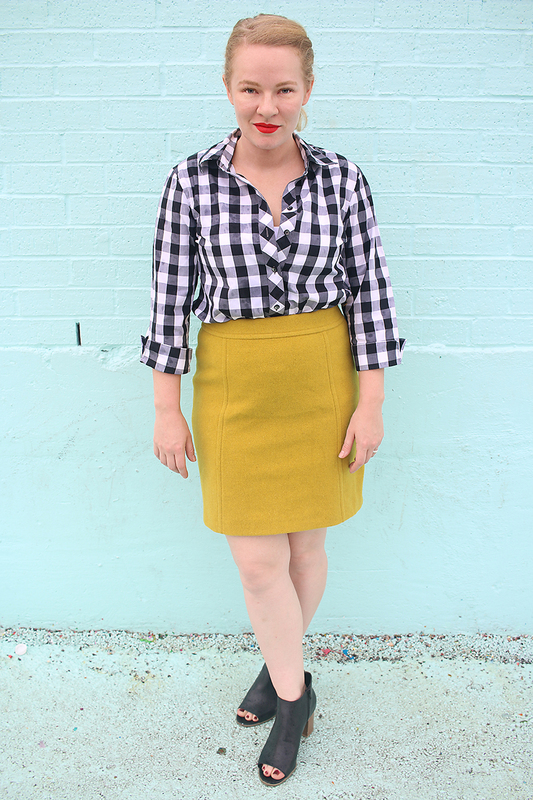 It looks great with the gingham top! Dresses are easier to style but skirts are cool too! Separates allow you to create even more outfits by mixing and matching. I love your skirt and your plaid top. Your boots look great with this look. 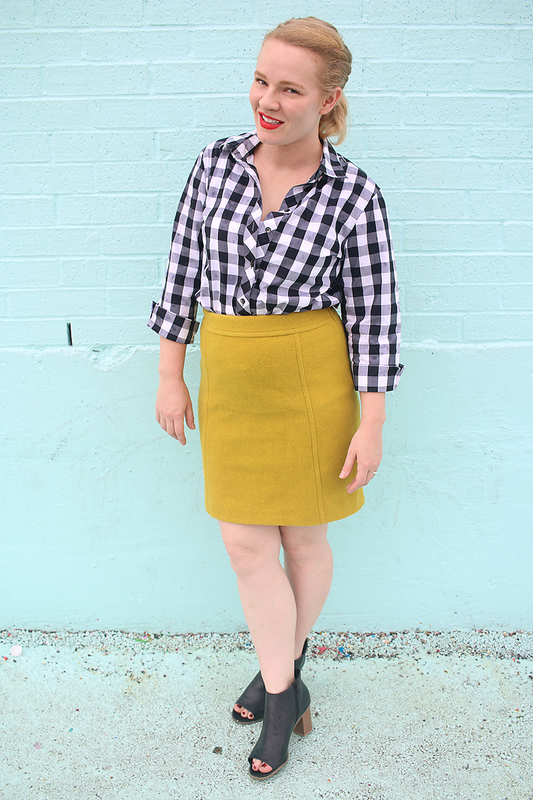 Love the mustard skirt! A great fall staple. 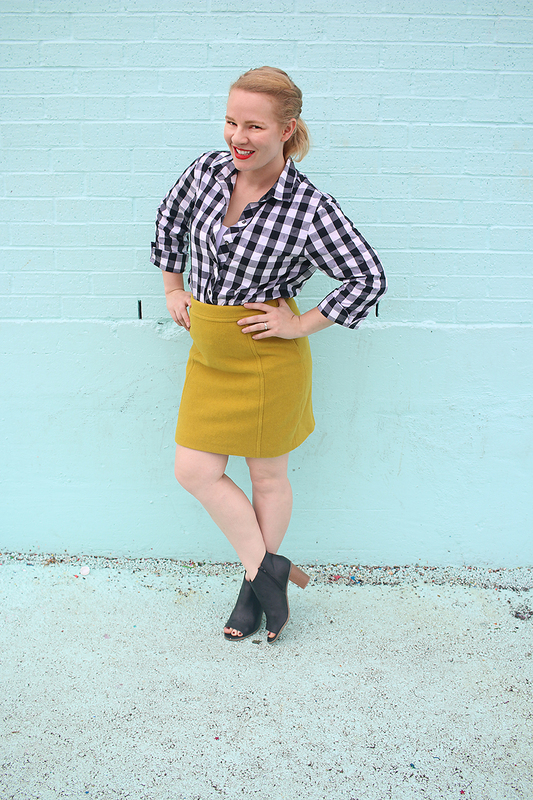 Fabulous mustard skirt! It looks great with the gingham shirt and fantastic booties. I am SOOO in love with those booties and I want them in every color too. Perfect fall look.